Most of us aren’t destined for greatness. Yet many of us have been told we’ll do tremendous things. Our loved ones see themselves in us, and pull for us. If confidence proves our only barrier to success, it won’t be due to their efforts. They’re our cheerleaders. But really: what makes us special? The loved ones scoff at the question, but the world--the crowd--needs proof. The crowd: that uniform crush of mediocre men and women, far more alike than not, demands proof. 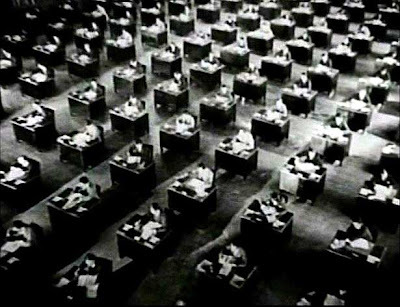 The Crowd, King Vidor’s masterful piece of silent cynicism, doesn’t believe in us, either. It demolishes its own hero, Johnny Sims, in its first ten minutes. Eight-year-old Johnny sits on a fence rail with his friends, describing his future. He doesn’t know what his future will hold—only that it will be bright. His Dad said so. That’s when the children notice an ambulance arriving at Johnny’s house. Dad is about to die. Vidor now places his camera at the top of the staircase in Johnny’s home, pointing downward. At the foot of the stairs is a cluster of family and friends. 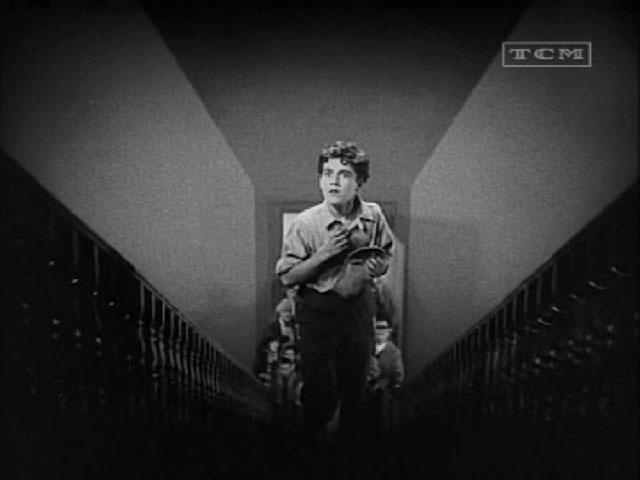 Johnny, alone among them, begins climbing the stairs, growing larger in the frame. The look on his face is the thing: confusion, bewilderment. He’s above the crowd, but he’s lost. And so shall his life be defined. 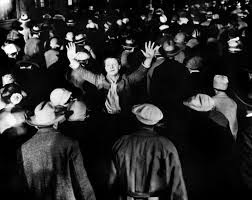 The Crowd is one of the greatest of silent films. It’s also one of the greatest of films, period, but the first description is best, because The Crowd’s silence is key to its power. Other late silents, starring the Brooks’s and Garbo’s, are acted in a manner so close to sound pictures that they seem to lack nothing but the murmurs. The Crowd, however, draws from its roots. It takes full advantage of the silent cinema’s ability to draw broad character-types, imbued with humanity by the pantomime artists who played them. And so we have Johnny (James Murray), the charming, dreaming ne’er do well, and his spirited, suffering wife, Mary (Eleanor Boardman); a supportive pragmatist of the sort ne’er do wells rely upon to keep eating. What’s interesting is that John and Mary know they’re types. They marry quickly (perhaps from lust, since both are beautiful), go to Niagara Falls for their honeymoon and eventually have kids, as though fulfilling the demands of a template. While Mary keeps house, Johnny wins bread by writing numbers down one side of a ledger with a fountain pen, all day long. His desk is one of about a hundred, arranged in straight rows over the floor of a huge room in a huge office building in huge New York City. Johnny hates his job; he amuses himself by writing ad slogans he hopes will win him a prize. He does this on company time. At home, Mary tends to mundane matters, and waits. Months become years. The marriage deteriorates. Mary and Johnny fight, and blame, and measure their strength in terms of their capacity to overlook past problems. And Mary, for whom we have far more sympathy, grows acidic and blunt. Yet whenever things go well, as they occasionally do, there’s Mary, dancing a dim-witted jig right alongside her husband. Mary, like Johnny, is capable of huge emotional shifts the moment her misery is lifted. Perhaps this is not because either of them is truly joyful, but because each recognizes that immense joy is what they ought to feel at that moment? I wonder. Mary, like Johnny, sees happy couples in magazines every day and believes they can be like them. The more like them they seem to be, the happier they act. But Johnny and Mary shift between joy and sorrow so rapidly that all their dreams and goals seem false to us. It is Boardman’s performance that anchors the film. It is her Mary who must develop from a snarky gum-chewer to a worn-out but wiser wife by the end of The Crowd. Boardman’s finest moment comes when she threatens to leave Johnny. It is he who then walks out the door—on his way to work—and she is alone. Only now do we find out she is pregnant—a revelation that comes not from anything she says so much as a sudden look of horror on her face when she realizes she will have to raise that baby without a father. When she calls Johnny back, and tells him the news, both husband and wife are all smiles. Johnny’s still a bitter, lazy dreamer, but now he’s a Dad, too. The way Mary smothers her unhappiness as the now-doting Johnny tends to her breakfast (a breakfast she cooked for him, which he only half-ate) will never leave you. This couple have far crueller days ahead of them. But let’s move ahead to the ending: scenes that comprise one of the greatest closing moments I’ve ever witnessed on-screen. It is a hard thing to describe without revealing too much. It’s enough to say that Johnny is humiliated on a deep, deep level—so deeply that he cannot detect it. And so profoundly is he degraded that he laughs his head off at someone exactly like himself. That is, someone exactly like everybody else. And we know it. The crowd has rendered its verdict. 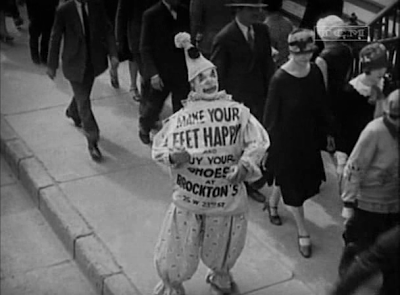 The Toronto Silent Film Festival screened The Crowd on Saturday, April 6, 2013. Live accompaniment was provided by Laura Silberberg. This film really is one of the best, ever...the final scenes knocked me for a loop. Not even Billy Wilder in "The Apartment" could make a film about an Everyman in the City as honest as Vidor did. And "The Apartment is a hell of a movie!